VL Rojo Designer 4/128 is sired by VL Designer 92/1, a bloodline for muscle and clean lines. 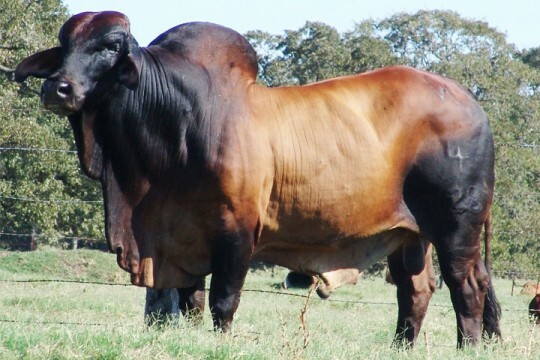 It is also one of the most proven and long lasting lines of cattle at Santa Elena. Descendants of this line are noted for their good udders and desired teat size. 4/128’s dam, 98/7 is recognized for her milking ability, fertility, and strong maternal traits. This bull had a birth weight of 85 pounds, weaning weight of 587 pounds, and a yearling weight of 900 pounds. As a mature bull he is 2,020 pounds and stands 60 inches. 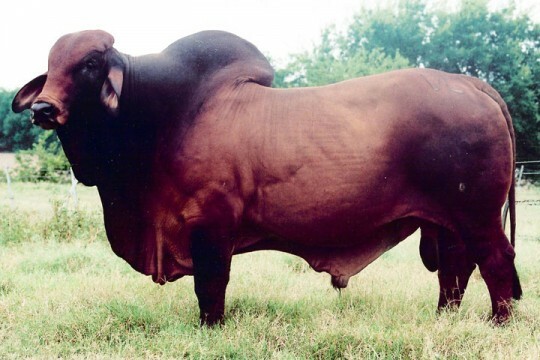 We suggest you use 4/128 for muscle, outcross genetics ,and his color as he is one of the darkest pigmented bulls in the red Brahman world and we are confident he will be an excellent cross to produce 100% American Red Brahman.